Guitars from sustainable non-tropical woods. Everyone knows that the best classical and acoustic guitars are made from tropical woods, right? But these exotic woods (e.g. rosewoods, mahogany, ebony etc) are getting scarce and ever more expensive. Moreover, most of these woods are illegally logged from tropical rainforests with severe environmental consequences (Fig 1). Many of the exotic tropical woods are now protected and their trade restricted under the Convention of International Trade in Endangered Species (CITES) – an international agreement among governments that aims to ensure that international trade in species of plants and animals does not threaten their survival. For the luthier it means that these woods, which have been traditionally used in guitar making, are becoming increasingly hard to obtain and consequently ever more expensive. For those tropical woods still available, care needs to be exercised to ensure that they are from a legitimate source as, despite certification processes such as that of the Forest Stewardship Council (FSC), it is estimated that between 50 – 80% of tropical wood is still illegally harvested. 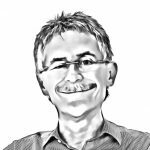 From the point of view of instrument makers, the increasing regulatory environment and pressure from environmental action groups will continue to decrease the availability of tropical woods, with consequent upward pressure on prices to meet demand. Criminal organisations will continue to attempt to meet demand through illegal logging, and luthiers will need to be vigilant to ensure that their tonewood supplies originate from reliable, certified sources. Against this background it is becoming increasingly important to search for alternative woods for instrument making that allow the crafting of high quality guitars in an economically viable and ecologically sustainable way. However, would these guitars sound as good as those made with traditional tropical woods? The Leonardo Guitar Research Project (LGRP) was set up to study, demonstrate and communicate the possibilities for building classical and steel string acoustic guitars with non-tropical woods. The project is a ‘not-for-profit’ partnership amongst 3 partner musical instrument building schools (The Centre for Musical Instrument Building, Belgium; Newark College, UK; and Ikata Arts and Crafts school, Finland) and 4 renowned independent luthiers (in Eire, Italy, Spain, France). The project is funded by the European Commission’s programme for youth education and training. By using the schools best students under the close guidance of the teachers and expert luthiers, the team created the capacity to make a large number of guitars, using either tropical or non-tropical woods for comparison (Fig 2). The guitars were then tested under a series of blind and non-blind tests using professional musicians, luthiers, and public audiences (Fig 3). We wanted to determine if guitars made from non-tropical woods could be distinguished in ‘blind tests’ from their tropical counterparts for sound quality. 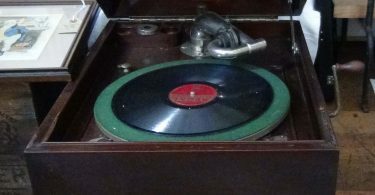 In addition we wanted to understand the role played by aesthetics and pre-conceptions of tonewoods on the sound perception of the guitars. The blind testing showed that non-tropical woods could be used to make guitars equal in sound acceptance to those made with tropical woods. However, under non-blind test conditions, the sound preference shifted strongly in favour of the tropical wood guitars. Aesthetics (e.g. a preference for darker woods for backs and sides; black fretboards) and/or pre-conceptions about tonewoods (such as a belief that the best guitars are made with tropical woods) appear to exert considerable influence on sound perception. Now, thanks to additional funding from the European Commission’s Erasmus+ program, we are able to continue the project through to the end of 2017. During this second phase of the program we will build more guitars and refine our testing procedures with the goal of better understanding the roles played by aesthetics and tonewood predudices and their influence on sound perception. Visit www.leonardo-guitar-research.com and our Facebook page to stay updated. Fig 2. The woods of the backs and sides of the tested guitars. 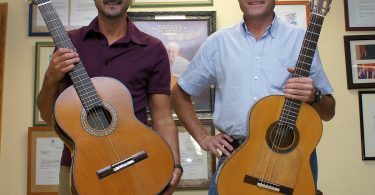 These classical guitars were based on the Torres model and all used European spruce for the tops. All aspects of the build process were controlled including neck and fretboard shapes and the final setup. Fig 3. 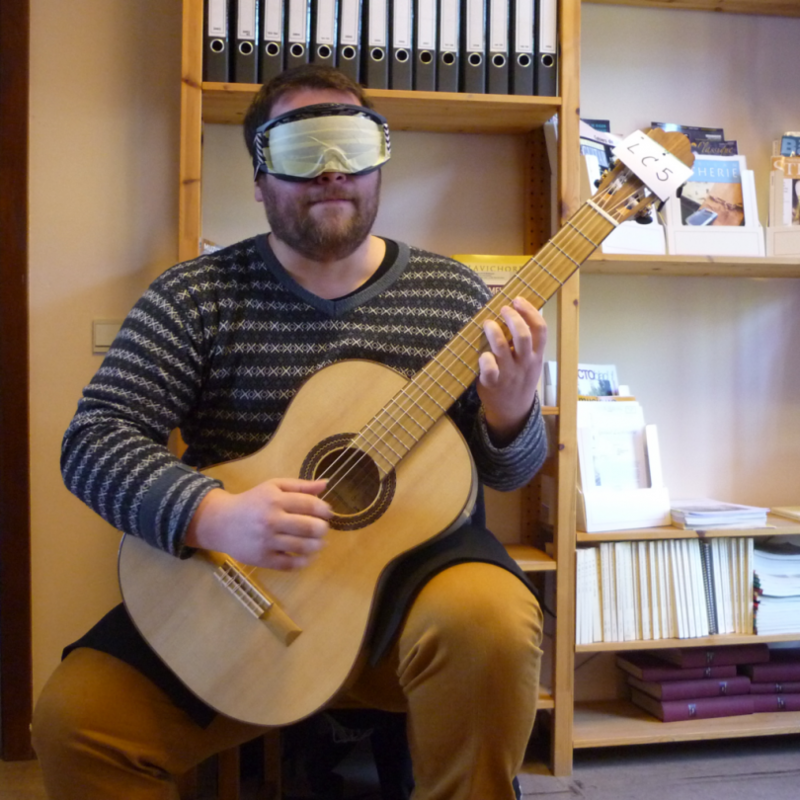 A blindfolded musician plays on of the guitars during the testing program.